So today I somehow forgot it was National Comic Book Day, wow I’m shocked honestly. Yet I had some time so I decided to kick back and relax with Ant-Man Vol. 1: Second-Chance Man by writer Nick Spencer, artist Ramon Rosanas, and colorist Jordan Boyd. Here’s the best part about reading this in trade, it really does gel together as a full story collected. Scott Lang as Ant-Man has a tale that warms your heart and by the end breaks your heart. I’m trying to be careful as to not spoil much for you but it is a sweet story that has so much heart behind it. Nick Spencer does an amazing job of making Scott Lang a fully fleshed out character, this is one of the best spotlights for him. It goes through every bit of Ant-Man history in one way or another too, especially as it comes to Lang starting his own business venture. You even get to know more about his ex-wife and his genuinely cool friendship with his daughter Cassie. 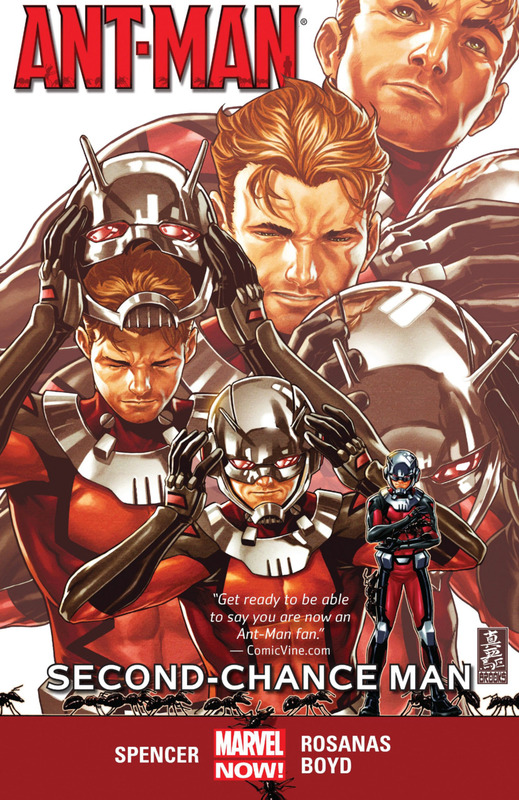 It’s got family drama, superhero adventure, and really Ant-Man Vol.1: Second-Chance had it all and left me really caring for Scott Lang for the first time in a long time. I liked Scott Lang in his FF time with Matt Fraction and Mike Allred, yet Nick Spencer got Scott Lang clicking for me. His take on him got me. In fact so much so that I’m now going to be making a point to finish up Superior Foes of Spider-Man as soon as possible, Spencer’s Ant-Man is just that good. It’s a rare comic that makes me get a genuine laugh out of situations as much as it gets me to feel for the character. Even more is that this is such a fluid take on Ant-Man as to how the character moves about in the world. Ramon Rosanas is so good with fluid movement and capturing the action on the page. Just as much as he captures the emotions flowing from Spencer’s script at points. I loved Jordan Boyd’s coloring on this too, it sets such a mood. The final page of issue 5 especially has such a sense of gut punching you with the color choices, art, and the Scott’s mood by the end, heartbreaking and powerful work. Stay for the humor, enjoy the characterization, and it makes all the emotions that much more powerful. Now that we got the aspects of the comic out of the way that broke and also lightened my heart, let’s get into some of the small stuff in the comic that caught my eye. One I love Scott Lang’s Ant-Man costume. It’s got a great look to it keeping the classic Ant-Man design while tweaking with it enough to make Scott Lang’s Ant-Man truly unique. I really liked that and kept with the motif that since this guy was once a thief and does security work, he would want a costume that he could function in. I also like as he gets his business started the characters he works with. Grizzly and Machinesmith are a riot and become great characters in their own right as the issues go on. I can’t wait to see what the new Ant-Man series holds when it releases and now I’m sold on it thanks to this new trade. Now I need to read the Annual and the Last Days of Ant-Man story as I’m hooked and want more before the new series hits. Ant-Man Vol. 1: Second-Chance Man is great and you can get it via your local comic store, bookstore, Comixology, Amazon, and you don’t want to miss it. This is some good comic reading and a book that genuinely moves you while making you laugh all at the same time. Posted on September 25, 2015, in Comic Collections, Graphic Novels, Marvel Comics and tagged ant man, comic books, Jordan Boyd, Marvel Comics, nick spencer, Ramon Rosanas, Scott Lang, Trade Paperback. Bookmark the permalink. Leave a comment.